WASHINGTON – Rep. John J. Duncan, Jr. (R-Tenn.) announced changes Friday to federal rules preventing the placement of American Flags on Veteran graves on Veterans Day. Federal floral regulations for National Veterans Cemeteries had allowed the practice only on Memorial Day. In his response to Rep. Duncan last week, Secretary Shinseki announced changes that will allow flags to be placed on gravesites at National cemeteries on Memorial Day and any other day of the year on a case-by-case basis. 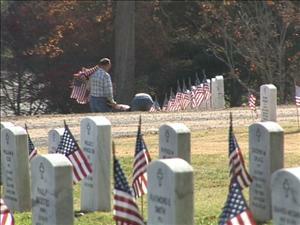 Last year, many East Tennessee residents were appalled to learn they might not be able to place American flags on gravesites at the East Tennessee State Veterans Cemetery in Knoxville on Veterans Day. The Tennessee State Department of Veterans Affairs had been yielding to the federal regulations regarding the placement of flags.